Once upon a time in New York City, a woman in her 30s went on a first date. When she showed up at the bar—a dimly lit dive in the East Village—her date was already waiting in a cozy booth. She sat down. They made small talk. When the conversation lulled, he reached over to the far side of the booth to grab something. Her eyes followed his hand as it grasped—a backpack. He pulled it close, unzipped the top and flashed a sly smile. Piece by piece, he extracted the contents of an entire picnic for the two of them to enjoy with their watery Old Fashioneds. Yes, it was a “move,” but hot damn if it wasn’t a good one that absolutely assured he’d get a second date. Now, we’re not saying you should take this story as a hint to show up to every first date with with an entire meal on your back, but we’re also not saying that you shouldn’t. That’s what makes the humble, versatile, formlerly extremely academic-only backpack such an icon of utility. Whether you use it for unexpected romantic gestures or just to lug your laptop to and from the office each day (or both?! ), the backpack deserves some credit for all it can do. Ahemmmmm, a note. To be clear, there are a few places they probably shouldn’t go. A good rule of thumb is leave the backpack at home when you’re headed anywhere you wouldn’t wear sneakers. Think weddings, funerals, galas, and formal corporate office environments. Now that we’ve gotten that fuddy-duddy caveat out of the way… From sporty waterproof nylon to borderline-sensual suede, we’ve hand-picked six outstanding packs and assigned them some totally real and not-at-all silly superlatives that should paint a nice, vivid picture of both their vibe and their purpose. Let’s kick things off with a backpack that delivers major style points along with you know, all the stuff you need a backpack to do. It holds your water bottle, stashes your laptop in that sleeping bag-esque pocket we’ve all come to expect from backpacks, and is made from super-strong, you-can-do-whatever-with-me 1000D nylon. Best of all, the namesake Y-shape strap sets this Topo Designs bag apart in a sea of look-a-like canvas and nylon packs. Anyone who has ever taken the E train to JFK will understand why we stan for this genius bag from Timbuk2. It can be rolled like a suitcase, carried like a duffel, or swung over your shoulders as a backpack—which means that no escalator from the subway platform, no crowded AirTrain to your terminal, and no mad dash to your gate can keep you down. This style really has it all. It’s like the Chrissy Tiegen of backpacks. This totally waterproof Rains bag is a minimalist commuter’s dream come to life. The rounded shape and unfussy design are simple without being boring, which we appreciate. This is the kind of bag we envision on the back of that guy who pedals a Citi Bike to work in a full suit and thinks Filson messenger bags are too “outdoorsy” for the office. If you’re fully committed to the adult backpack as your bag of choice, you may as well go all in. Since getting a new designer (Stuart Vevers) and a new lease on life, Coach has emerged from the ‘revived heritage’ slush pile as a menswear brand we really, really like. The woven details and elongated leather zipper pulls give this backpack a slightly Western vibe, but the all-black colorway makes it muted enough for a city slicker. 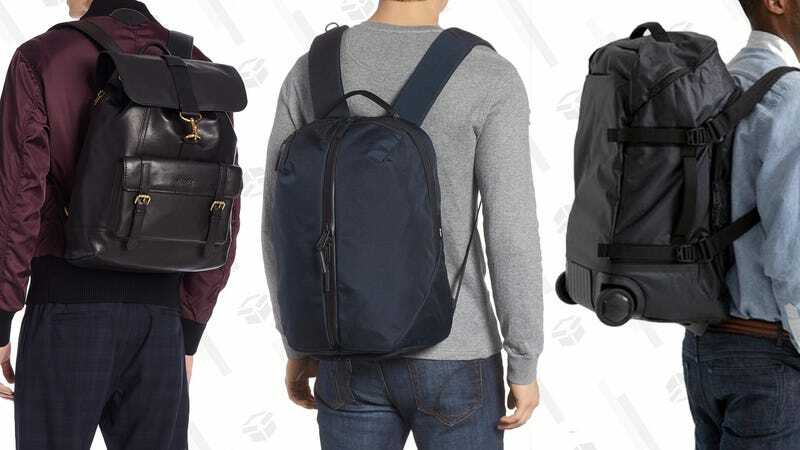 Aer’s Fit Pack 2 gets our vote for the best pack that’s as practical for traveling and commuting as it is for hitting the gym. It has a separate mesh-vented compartment at the bottom just for your shoes, making it ideal for stashing your soggy trainers after a rain-soaked run or stuffing in your next-day shoes when you use it as an easy overnight bag. Rugged yet sophisticated. Outdoorsy, but totally at home in the city, too. Stylish, timeless and not ashamed to be just a little bit bougie. Tanned to perfection. Also, waterproof. Is this the description of our perfect man? Yes, but it’s how we’d talk about this gorgeous suede backpack from Filson, too. As much as someone can possibly swoon over a bag…we are.